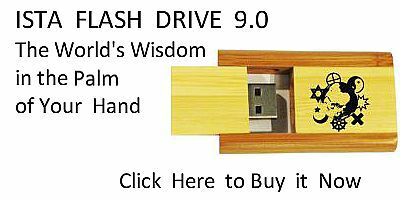 faithful, so true, who had done no wrong either in word or deed, was left sorrowful and deserted because of the cunning wiles of a wicked enchanter. Fearing nothing, she sought the Red Cross Knight through woods and lonely wilderness, but no tidings of him ever came to her. One day, being weary, she alighted from her steed, and lay down on the grass to rest. It was in the midst of a thicket, far from the sight of any traveller. She lifted her veil, and put aside the black cloak which always covered her dress. When Una saw the gentleness of this kingly creature, she could not help weeping. 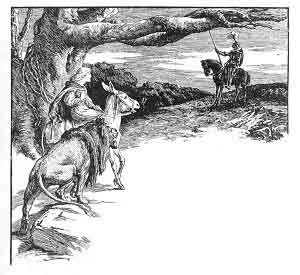 Sad to see her sorrow, he stood gazing at her; all his angry mood changed to compassion, till at last Una mounted her snowy palfrey and once more set out to seek her lost companion. waited diligently, ready to help her in any way he could. He always knew from her looks what she wanted. hear, nor understand. But when she saw the lion standing beside her, she threw down her pitcher with sudden fear and fled away. Never before in that land had she seen the face of a fair lady, and the sight of the lion filled her with terror. Fast away she fled, and never looked behind till she came at last to her home, where her blind mother sat all day in darkness. Too frightened to speak, she caught hold of her mother with trembling hands, while the poor old woman, full of fear, ran to shut the door of their house. By this time the weary Lady Una had arrived, and asked if she might come in; but, when no answer came to her request, the lion, with his strong claws, tore open the wicket-door and let her into the little hut. There she found the mother and daughter crouched up in a dark corner, nearly dead with fear. The name of the poor old blind woman was Superstition. She tried to be good in a very mistaken way. She hid herself in her dark corner, and was quite content never to come out of it. When the beautiful Lady Una, who was all light and truth, came to the hut, the mother and daughter, instead of making her welcome, hated her, and would gladly have thrust her out. Trying to soothe their needless dread, Una spoke gently to them, and begged that she might rest that night in their small cottage. 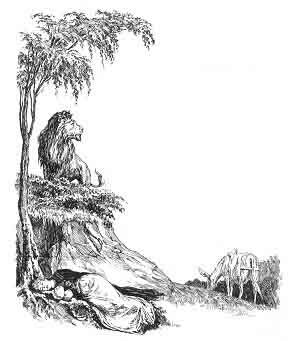 To this they unwillingly agreed, and Una lay down with the faithful lion at her feet to keep watch. All night, instead of sleeping, she wept, still sorrowing for her lost Knight and longing for the morning. of the little cottage were asleep, there came a furious knocking at the door. This was a wicked thief, called "Kirkrapine," or Church-robber, whose custom it was to go about stealing ornaments from churches, and clothes from clergymen, and robbing the alms-boxes of the poor. He used to share his spoils with the: daughter of the blind woman, and to-night he had come with a great sackful of stolen goods. When he received no answer to his knocking, he got very angry indeed, and made a loud clamour at the door; but the women in the hut were too much afraid of the lion to rise and let him in. At last he burst open the door in a great rage and tried to enter, but the lion sprang upon him and tore him to pieces before he could even call for help. His terrified friends scarcely dared to weep or move in case they should share his fate. When daylight came, Una rose and started again on her journey with the lion to seek the wandering Knight. As soon as they had left, the two frightened women came forth, and, finding Church-robber slain outside the cottage, they began to wail and lament; then they ran after Una, railing at her for being the cause of all their ill; they called after her evil wishes that mischief and misery might fall on her and follow her all the way, and that she might ever wander in endless error. enchanter, Hypocrisy, who was seeking Una, in order to work her fresh trouble. When he saw the old woman, Superstition, he asked if she could give him any tidings of the lady. Therewith her passion broke out anew; she told him what had just happened, blaming Una as the cause of all her distress. Archimago pretended to condole with her, and then, finding out the direction in which Una had gone, he followed as quickly as possible. Before long he came up to where Una was slowly travelling; but seeing the noble lion at her side, he was afraid to go too near, and turned away to a hill at a little distance. When Una saw him, she thought, from his shield and armour, that it was her own true knight, and she rode up to him, and spoke meekly, half-frightened. "Ah, my lord," she said, "where have you been so long out of my sight? I feared that you hated me, or that I had done something to displease you, and that made everything seem dark and cheerless. But welcome now, welcome!" "My dearest lady," said false Hypocrisy, "you must not think I could so shame knighthood as to desert you. But the truth is, the reason why I left you so long was to seek adventure in a strange place, where Archimago said there was a mighty robber, who worked much mischief to many people. Now he will trouble no one further. This is the good reason why I left you. Pray believe it, and accept my faithful service, for I have vowed to defend you by land and sea. Let your grief be over." When Una heard these sweet words it seemed to her that she was fully rewarded for all the trials she had gone through. One loving hour can make up for many years of sorrow. She forgot all that she had suffered; she spoke no more of the past. True love never looks back, but always forward. Before her stood her Knight, for whom she had toiled so sorely, and Una's heart was filled with joy. 18:1 The figure of the lion may be taken as the emblem of Honour, which always pays respect to Truth.